These are 5 Facts About Invoice Finance for businesses that you should know about it you are an existing user, or if you are looking for a new source of business finance. 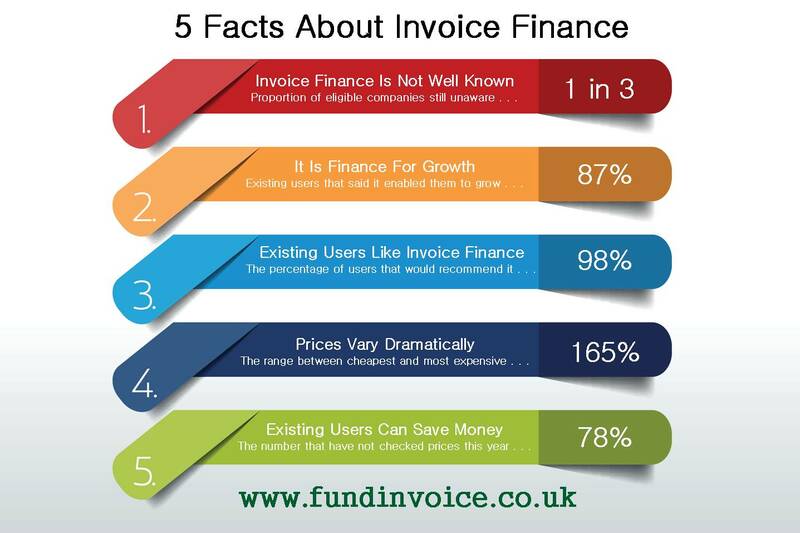 <a href="https://www.fundinvoice.co.uk/blog/invoice-finance/post/5-facts-about-invoice-finance.html" ><img src="https://www.fundinvoice.co.uk/images/facts-about-invoice-finance.jpg" alt="5 Facts About Invoice Finance" width="450" /></a><br /><a href="https://www.fundinvoice.co.uk/blog/invoice-finance/post/5-facts-about-invoice-finance.html" >Invoice Finance</a> by <a href="https://www.fundinvoice.co.uk/" >FundInvoice</a>. The level of awareness of invoice financing is still very low. Our research suggested that 1 in 3 eligible businesses were not aware that it might be an option for them. It is a great source or finance for business growth. 87% of existing users, that we spoke to, said that using it had actually enabled them to grow. Existing users really seem to like it. When we surveyed a number of current users of these products, 98% told us that they would be happy to recommend these products to other businesses. Prices vary dramatically. We undertook a mystery shopper study regarding pricing for a fairly standard factoring prospect. The rates that we were quoted varied by 165% between the most expensive and the cheapest quote. There are opportunities for existing users to save money. Our survey found that 78% of existing customers hadn't checked their pricing against the market over the last year. There are substantial savings to be made (see point 4 above). Like A Quote For Invoice Finance? FundInvoice offers a free, independent quote search and advice service for various forms of business finance. So if you would like a quote for invoice finance, you can call us on 03330 113622 or use the quote request form at the side of this page.